You know how people say things and it just rubs you the wrong way sometimes? They certainly don’t intend to offend and yet there it is. You force a smile because you know they mean well. But all you can hear is the blood rushing in your ears and all you can feel is your cheeks getting hotter and hotter. This is exactly how I feel when I hear people say “Cancer is a gift”. I don’t know what kind of a crappy gift giver you are but I am sure that no matter how bad your taste cancer most certainly is NOT a gift. But, when you wade through the flood waters you will find that although cancer itself is not a gift, it most certainly gives you things. You see I’ve just been through the worst thing in my life. (Up to this point.) And I have survived it so far. Everything else sort of pales in comparison after you’ve faced mortality. Most people would believe that cancer steals time. At first, of course, it does feel that way. However throughout this journey my husband and I have spent more time together than we ever have. More than when we were first dating! Sure it’s time spent in waiting rooms, exam rooms, pre op rooms, car trips to see specialists, or at home fighting the fight. But we have grown closer than we have ever been. As my best friend put it “this cancer thing might the best thing that has ever happened in your marriage”. And although that’s a tough thought to stomach she has a point. This is the point in life when a job becomes a job. You realize what’s really important. And what’s not. You come home early from work (or even just on time). You splash in the mud puddles even if it means another load of laundry. Moments become crystallized as you hold on to every opportunity to make memories. It becomes so much less important that the house is well kept or that the laundry is put away. I’ve always known what things were really important but now I am living it. Being a strong southern woman I’ve always been a do-it-yourselfer. I don’t ask for help and under no circumstances do I take charity. But I’ve learned the art of humility over the last few months. The kindnesses bestowed upon my family have been overwhelming and I was in no position to “do it myself”. As hard as it was I swallowed my pride and learned how to not only accept help but to graciously ask for it. 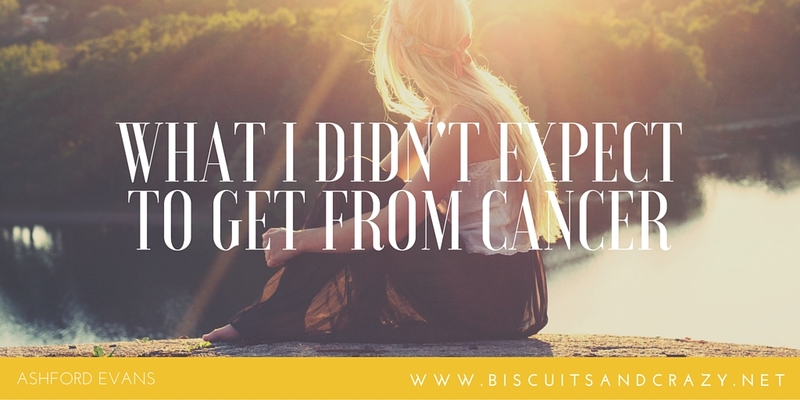 While dealing with chemotherapy we were pushed to edge of our limits. To the bare minimum of survival. Coming back from this leaves you with a sense of gratefulness for every little thing. It starts small- grateful he made it through the night without vomiting, grateful he gained a pound, grateful the pain was controlled- and it grows to be all encompassing. I am grateful I woke up next to him- hell, I’m grateful I woke up. I’m grateful he’s working again. I’m grateful for the friends and family that support us. I’m grateful my children seem largely unaffected by the last few months. I am grateful God gave me strength and endurance. But more importantly and I am reminded every day that I am grateful he is alive and here with me now. So although I would never wish this journey on anyone I can say with confidence that I am better for it. I have learned so much, grown so much- and I know this isn’t where it ends. In fact, I believe this is just the beginning. So well written….so many truths.